European Spanish (Español peninsular) uses two different tenses to talk about past events in cases where in English we generally use one. Knowing whether to use El Pretérito Perfecto ("he ido") or El Pretérito Indefinido ("fui") can be tricky at first but it's actually pretty easy. The rules are simple once you understand how we think about units of time: days, weeks, months and years. I went to the doctor this week. I went to the doctor this month. He ido al médico hoy. He ido al médico esta semana. Fui al médico la semana pasada. He ido al médico este mes. If we're expressing ourselves in blocks of days then "Yesterday" is in the past relative to today and therefore requires "fui". If we're talking about exactly the same event but using the time block "this week" then that is still current because the event and the speaker are in the same time block, so the speaker uses "He ido". Easy! Attention: the smallest block of time is one day when considering which tense to use. Morning, afternoon, evening and night do not count as 'time blocks' for this purpose. If it's now the afternoon, you will still use He ido to say I went somewhere in the morning. Lo he visto hace 2 minutos. I saw him two minutes ago. Lo vi hace 3 días. I saw him 3 days ago. You might think this concept of time blocks determining choice of tense is strange at first, but in fact, in English we use the perfect tense with the very same time blocks (albeit with a different nuance, e.g. to introduce a new fact or express a sense of continued action). I’ve been to the doctor yesterday. They feel very strange because the time block is over. 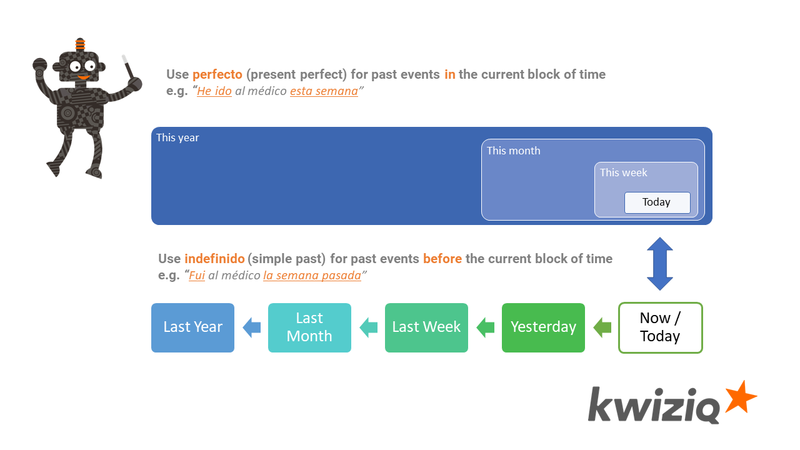 Spanish is the same: don't use the present perfect to talk about events in previous blocks of time. Use the simple past instead. While there are instances where this will work, in general this is a mistake and the English preterite is the appropriate choice. El año pasado estudié economía. Last year I studied Economics. El 5 de agosto fue su cumpleaños. It was his birthday on August 5th. Tú trabajaste en nuestra empresa en 2007. You worked in our company in 2007. Reservé la habitación hace dos días. I booked the room two days ago. Ellos eligieron el menú de la boda el viernes pasado. They chose the wedding menu last Friday. Quedamos con Javier el otro día. We met up with Javier the other day. Tú comiste muchos dulces ayer. You ate a lot of sweets yesterday. El verano pasado entrené mucho para la maratón. Last summer I trained a lot for the marathon. Vosotros habéis viajado mucho este año. You travelled a lot this year. Hemos ido a pasear esta tarde. We went for a walk this afternoon. Ellas han salido tarde de trabajar hoy. They left late from work today. Ellas han dormido mucho esta semana. They slept a lot this week. Nosotros hemos planificado la estrategia en estos últimos días. We planned the strategy over the past few days. Ellos han estado muy enfermos en los últimos meses. They were ill over the last few months. Unfortunately Kwiziq is still only offering Spanish from Spain. But we are planning to offer Spanish from Latin America soon. One of the first lessons will be the one you are mentioning! I've just realised that this lesson needs more detail to cover ser and estar. When talking about something earlier in the day, generally, something that uses estar will use imperfecto, not perfecto nor indefinido, breaking the rule completely! Whereas ser will follow the rule. So if we ate something delicious this morning we'd say, "!Estaba rico!" not "he sido rico" nor "estuvo rico". You are correct when you say we use estar in El Imperfecto to talk about something earlier in the day, but I don't think it applies to everything. The example you are giving talking about something someone ate earlier in the day is perfect "estaba muy rico". We would also use the same phrase when you've just finished a meal (like when you put down your cuttlery on top of your plate after eating the last crumb); you would never say here "ha estado muy rico" or "estuvo muy rico". However I can think of other situations where this wouldn't apply. For example, if you come out of the cinema after watching an amazing film, you could say to your friend "Ha estado genial, ¿verdad?". Here we wouldn't say "Estaba genial ¿verdad?". Thanks Inma - that's good to know! What about the other cases where we use estar. I suppose you can use both imperfecto and perfecto for the position of the car this morning but they have a different nuance regarding whether the car is still there? "Esta mañana mi coche estaba aparcado enfrente de mi casa"
What I want to convey here with the use of estar in the imperfect is that my car was parked opposite my house this morning, without seen the action as a completed action. I may have moved the car later on, but this is not relevant. "Esta mañana mi coche ha estado aparcado enfrente de mi casa"
What I want to convey here with the use of the perfect tense is that my car was parked opposite my house but it generally implies that it is not there any longer. It has been parked there for some time during the morning but now it is not. It is seen as a completed action. Is this distinction not made in Latin American varieties of Spanish? I'll study this lesson, regardless, but I would like to know whether speakers of LA Spanish would choose one of these tenses and if so, which one. At the moment all our content is based on Peninsular Spanish. We are planning to extend it to Latinamerican Spanish though in the future. For a general explanation of the main differences please go to What kind of Spanish will I learn where you can read about this. We hope this helps. Ellos han estado muy enfermos en los últimos meses. They were ill over the last few months. How do we know this is still the present and not the past? We consider it to still be connected to the present because the speaker is still inside those "last few months" at the moment of speaking. It is as if we are still counting the current month as part of those last few months. Estos últimos meses han sido difíciles para mí. No he visto a Juan en estos días. "El mes pasado fue difícil para mí"
"Ayer no vi a Juan." Here the time frames are clearly not connected to the present. How wrong is it to equate I have gone with he ido? In this lesson, peninsular Spanish is specified (however I am in the US and speak Spanish with Cubans, Mexicans, etc., so not only is this sort of new to me, it's not clear how useful it is). From what I've heard & read, there are many differences in the Americas in how the simple and compound past tenses are used (e.g., https://www.scribd.com/document/148697440/El-sistema-verbal-del-espanol-de-America-De-la-temporalidad-a-la-aspectualidad-Quesada-Pacheco-Espanol-actual-75-2001). If we include both peninsular and American (and other world) Spanish speakers, this is quite a range of variants. English speakers have a parallel set of past tenses in went/has gone. Obviously this is a false friend when compared to a specific dialect of Spanish such as the peninsular dialect (although I wonder how perfectly consistent this is across the peninsula). But is the English parallel any more “false” than the Ecuadorian, Peruvian, or Mexican one, relative to the peninsular one? How would a Spaniard respond if an American Spanish speaker consistently used the false English parallel to these tenses, compared to their response to an Ecuadorian, Peruvian, or Mexican speaker who consistently used their own native variant? When talking about the differences between Spanish spoken in Spain and Spanish spoken in Latin American countries it's never possible to talk about right and wrong. However, as we are a language-learning website we have (for the moment at least) chosen to describe one type of Spanish, with one type of English to describe it and while we are working on the technical challenges to change this, currently we are unable to account for all the permutations that variations of Spanish and English can create. Kwiziq Spanish currently focuses on Peninsular Spanish (FAQ: What kind of Spanish will I learn on Kwiziq) and the English we use is British English but we work very hard to not let English be a factor in our testing. We do love languages though so we consider our English carefully - even though Kwiziq's job is to teach Spanish and French we've got a whole article dedicated to English (FAQ: Is this English Correct?). There are plenty of moments when as a British English speaker I have spent time in the US and the way I express myself marks me out because it's just not what an American would have said. This doesn't mean that we can't understand each other, or think the other person speaks "incorrectly". Similarly, as a Peninsular Spanish speaker I've never been misunderstood by Argentinians, Mexicans, Colombians etc. We appreciate that there are significant linguistic differences. In the meanwhile, please do keep a list of any differences that you would like us to cater for as we can then design future updates around these needs. We can also update lessons with special notes on variations too, wherever you find these are needed - you can simply comment in the Q&A section under a lesson with a suggestion. We'll do our best to work around the issues as much as possible until we're in a position to handle them better.